Art is more than the images that enrich our lives. Art also records our passages through time and place, says Jesse Borlen ’14. 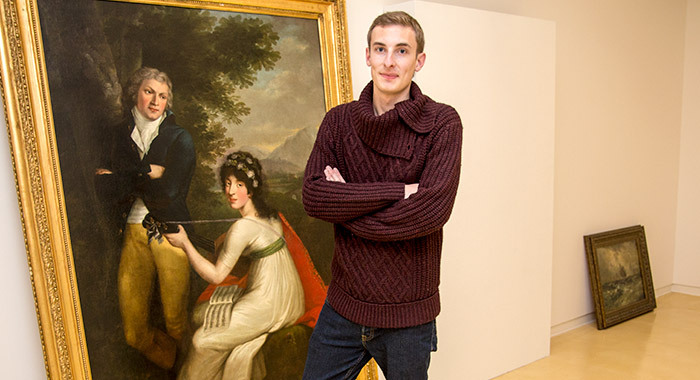 The art history student is exploring the subject through his independent major and through a curated exhibit, “The Passage of Art,” recently on display in the Bush Art Center’s Permanent Collection Gallery. Borlen’s show, chosen from the college’s permanent collections, included a 28-page catalog he researched and wrote. Borlen links the exhibit’s theme – the passage of time and ideas in the context of art – to a long-standing and personal interest in immigration. “My great grandfather emigrated from Croatia in 1913 and so my grandfather talks a lot about stories and stuff his father told him,” he says. For his research, Borlen chose oils by European-born artists who painted in different times and under the influence of different movements: Joseph Lange, Germany (late 18th century, Rococo); Robert Hopkin, Scotland (late 19th century, Romantic); and Leon Lundmark, Sweden (early 20th century, California Plein Air). Both Hopkin and Lundmark immigrated to the United States, adding a literal gloss to the phrase “passage of art.” And a Dr. and Mrs. J.P. Lenfestey brought Lange’s painting “Lotte & Schill” from Austria to De Pere, possibly in 1914 after their six-month European tour with Dr. and Mrs. Richard Buchanan. This foursome combined an eight-week clinical course in Vienna with museum visits, a zeppelin ride and an audience with Pope Pius X. They would later donate “Lotte and Schill” to St. Norbert. Hopkin’s painting originally hung in Martin Vierling’s bar in Marquette, Mich., Borlen discovered. Louis Vierling Jr. donated the Hopkin and the Lundmark works – both untitled – to the college. Borlen spent hours in research, drawing on resources online and at the De Pere Historical Society. The on-campus exhibit included newspaper articles and photos to augment the paintings’ stories. It was the Rev. James Neilson, O.Praem., ’88 (Art) who suggested to Borlen that he curate an exhibit to hang in the campus art galleries. A research fellowship from the office of admission funded his work. While “Lotte & Schill” is relatively unknown, Lange is well-known for an unfinished oil painting (1783) of Amadeus Mozart at the piano that hangs in the composer’s Salzburg birthplace. Mozart had married Constanze Weber, younger sister of Lange’s wife, Aloysia, in 1782. Constanze called Lange’s painting the best likeness of her husband. The college’s Lange shows Friedrich von Schiller standing next to his wife, Charlotte, who sits on a rock playing a nearly guitar or mandolin. Some music – probably Mozart since the letters “Moz” can be seen – lies on her lap. Borlen says the couple seems to have no physical or emotional connection, which suggests that the figures sat separately when they were painted. The portrait was painted in a studio with a backdrop, much like studio photographs today. “It is evident that Lange either disliked painting hands or was not very good at it,” Borlen says. The artist typically hides them. The painting may have hung in the Vienna Civic Opera House, where Lange acted. “He is connecting those stories on top of stories and making them meaningful,” says Brandon Bauer (Art), Borlen’s adviser. Hopkin was 21 when he immigrated, becoming Detroit’s leading mid-to-late 19th-century painter. Hopkin’s more than 390 oils and watercolors include the Detroit Opera House curtains and a mural on the Cotton Exchange in New Orleans. The Detroit Institute of Arts has several of the artist’s works, Borlen discovered. 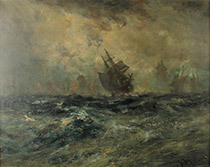 Hopkin depicts a stormy sea “on which float a ghostly flotilla of sailing ships. The sky above is dark and dreary with wispy clouds,” Borlen says. “Not only to hide the ghostly ships, but maybe to give the viewer a glimpse of clarity and hope.” He says the studio work is probably a memorial to ships lost in Great Lakes storms. Lundmark was 31 when he came to the U.S., settling in Pullman, Ill., and working on railroad sleeper cars in the Pullman Company’s decoration department. Away from work, he painted scenes of the Lake Michigan shore. After his big break in 1921, Lundmark exhibited around the world. In 1937 he moved west, pursuing the California Plein Air style that, like French Impressionism, sought to capture changing light outdoors. The exhibit was an artistic journey for Borlen, whose favorite among the paintings saw a shift from the Lange to the Hopkin. “I like the murky cloudiness of it,” he says. Borlen, who graduates this summer, is in the process of discerning his next step: to study either curating or art history in graduate school. Robert Hopkin would become Detroit’s leading mid-to-late 19th-century painter. Leon Lundmark painted scenes of the Lake Michigan shore before moving west as he pursued the California Plein Air style.